The resurgence of the Buffalo Bills over the last three weeks hasn’t just been encouraging in terms of the outlook for the season but it’s been somewhat relieving too. I’d be lying if I said I didn’t have my doubts heading into this season as injuries and suspensions pulled a number of key defensive contributors away from the team while question marks on offense left me wondering just how potent the Bills could be. Not to mention my willingness to buy into anything the Bills were selling hit an all-time low this summer. There’s only so much abuse you can take over a 16 year span before you adjust your behavior. But here we are. The Bills are enjoying a three-game winning streak which should almost certainly extend to five games when the dust settles against San Francisco and Miami. At 5-2 the Bills, and their fans, will have undergone a significant 180 from the days immediately following the eye-opening loss to the Jets. Perhaps the most encouraging sign about the Bills isn’t the impressive play of LeSean McCoy – who has been transcendent – but the successful conversion to Rex Ryan’s defensive scheme. You didn’t have to watch too many live American football matches last season to know the Bills didn’t have a full understanding of Ryan’s defense. But further personnel turnover has helped fit the right bodies into the right spots on that side of the ball and the play of the front seven is reflective of that. The obvious numbers jump right off the page. Buffalo has already piled up 17 sacks through five weeks, four fewer than their team total last year. They’re currently tied for fifth in points per game, up from 19th at the end of last season. The success, outside of simple buy-in from the players, traces back to the play of the front seven for me. 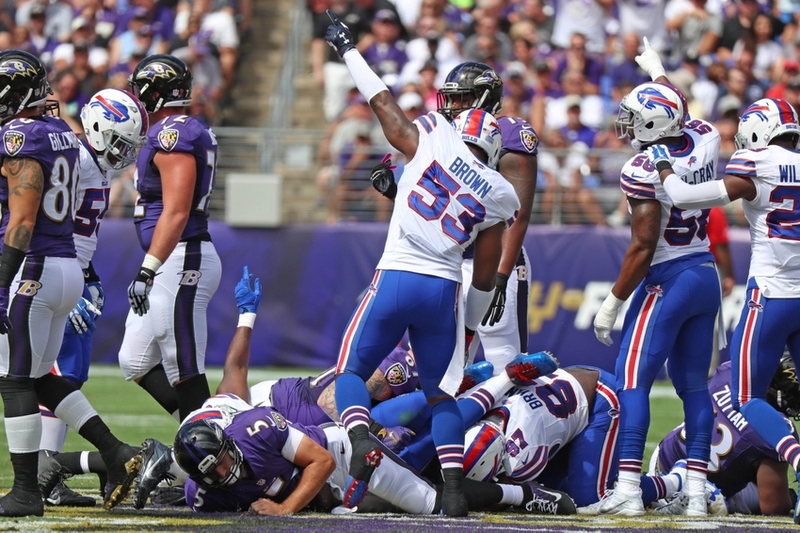 Zach Brown and Preston Brown have been the recipients of a great deal of praise for their play as both have earned the plaudits they’ve been showered with thus far. The pair have been running free against the run, wreaking havoc on a weekly basis. Zach Brown’s ability in coverage makes him that much more versatile and effective while Preston Brown is capable of playing in any situation. The duo’s production isn’t just encouraging for the defense but it’s fun to watch as they run hard downhill against the run. Much of this success is thanks, in part, to the cover provided by Buffalo’s line. Beyond the contributions of Lorenzo Alexander and Jerry Hughes off the edge, the interior rotation has been somewhat unheralded but equally bright when it comes to the play of Buffalo’s defense. There’s little difference in the play of the five-man rotation up front as Kyle Williams, Corbin Bryant, Adolphus Washington, Jerel Worthy and Leger Douzable haven’t just occupied blockers to allow the linebackers to run free, they’ve been mauling offensive lines and disrupting plenty on their own. Look no further than Washington, who played easily his best game as a professional against LA on Sunday. He, like the rest of the rotation, is explosive off the ball and is working to cause major protection and schematic issues for opposing offenses. This year’s defensive resurgence not only has helped lead the team to their recent winning streak but is likely earning Rex Ryan a fair bit of credit with the fans. Particularly those who had been doubting his ability as the head coach. What will be interesting, if they hit 5-2 after the Dolphins game, is how their play continues through the tough stretch that begins in week eight against New England. If they survive that middle stretch of the schedule they could truly be a playoff team and if they do it will almost certainly be because of the continued success on the defensive side of the ball. Nice post. I’ll be interested to see how well the defense performs against division teams the second time around. The Jets could possibly have a different guy under center and we know that New England will. Hopefully Rex continues to adjust and grow as the season goes on.